Born on Mars Colony, Tarses had long been interested in serving in Starfleet, but had decided to enlist as a normal crewman rather than applying for the Academy, as he doubted his ability to cope with the pressure of Starfleet Academy. 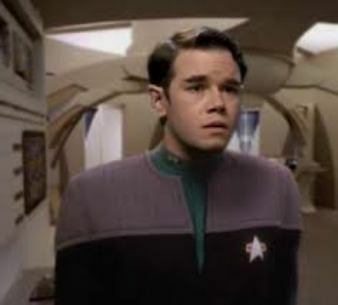 He eventually became an enlisted crewman first class, serving as a medical technician at several outposts before he was assigned to the USS Enterprise-D under Doctor Beverly Crusher. In 2367, an explosion in the Enterprise-D warp core led investigators to discover that J'Dan, a Klingon exchange officer on board the ship, had been involved in smuggling secrets to the Romulans. J'Dan admitted to his espionage, and hinted that there were co-conspirators on board the Enterprise-D as well. Simon Tarses, who occasionally administered a medicinal hyposyringe to the Klingon traitor, was extensively questioned by a Starfleet board of inquiry, which uncovered that Tarses was a quarter Romulan and not a quarter Vulcan, as he had falsely claimed on his Starfleet entrance application. His falsehood threatened to end his Starfleet career, although Captain Jean-Luc Picard spoke in Tarses' defense when he was later put on trial himself, arguing that Tarses' only crime was concealing his Romulan heritage and he had done no other harm. In 2376, Tarses—now a full MD—was assigned to the infirmary of starbase Deep Space 9 under the command of chief medical officer, Julian Bashir. Doctor Tarses ran DS9's infirmary while Bashir was away on a three-month exploratory mission of the Gamma Quadrant onboard the USS Defiant. In early 2377, Tarses came up with an innovative treatment involving nano-technology, genitronic replication and cybernetic regeneration that repaired the injured spine of Lieutenant Ro Laren after she was brutally assaulted by the rogue Jem'Hadar observer, Taran'atar. In 2379 he was assigned to Deep Space Nine (II) in the same role serving under Doctor Bashir.